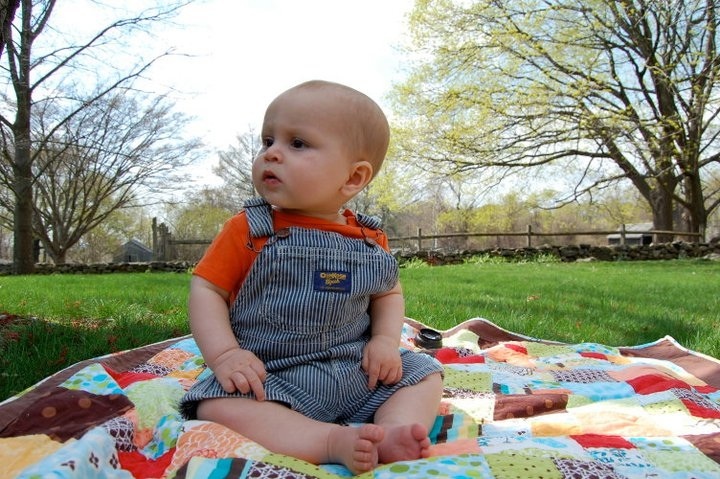 Kai was diagnosed with an inoperable brain tumor, a hypothalamic-optic glioma, at 8 months old. His tumor, although low grade (some even called it benign), was large and diffuse infiltrating many areas of his young brain. After sixteen months of treatment the tumor took his l life just after his second birthday. This is his story, which forever changed mine – life of Kai. As most of you know on May 28, 2011 Kai was diagnosed with a brain tumor – a Hypothalamic Optic Glioma. Although Kai’s tumor is inoperable his doctors are hopeful that treating it with lowdose chemotherapy over the next 60 weeks can keep it under control and prevent any further growth. We hope to use this blog as a way of staying connected while in the hospital and keep everyone updated. Please check back often and sign up for email notifications. After about 10 months on chemo (carboplatin/vincristine) Kai ‘failed’ off this protocol. He had NO shrinkage during this time and while his MRI showed no change in the tumor his clinical symptoms have worsened, mainly his vision. Kai is now considered legally blind and started a new chemotherapy protocol April 2012. He will now receive avastin/ irinotecan bi-weekly for the next one to two years. Kerri your doing a wonderful job… Thank you for being so supportive with our family as well! See you soon. Bless you guys for being strong. Have a sick child is not easy and will test your will. Continue to love one another and always focus on your family first. This blog will serve you well as ours did for us quadc.blogspot.com. Thanks so much for sharing your blog. I look forward to reading it. Prayers with Kai and the whole family! This is Lyra’s grandmother hoping and hoping for the best possible outcome for your little baby. Hi Kerri, Not sure if you remembers me, I’m Hind with baby Salim I use to go to craddle in northampton that’s where we met, Stephanie just told me about you and Kai, all my prayers are for you and Kai and please I would like to help as much as I can with anything that you need. All of us at tjmaxx are praying for you all. As a parent myself I can’t imagine what your going through.Just know you, Mark and espically Kai have so many prayers sent up there for you. You both are so strong, on the outside anyway…You are wonderful parents and if LOVE could make him well Because of Kai parents he would beat this. Just know our hear aches for you, And like you we are praying for a something, God. Love and lots of praying to help him. Again you both are wonderful parents and we are all standing behind you. Hi Kerri, I met you tonight at Sherry’s House. I just knew when you said Kai’s name that I once saw this magical little person on-line some place! I know every day is different and I hope you found some small comfort in our meeting tonight. Please know I would love to help you in anyway. I am currently home with the little and we are always around. My email is slriel@yahoo.com and I am on the WhyMe Facebook. Sending you strength from one Mom to another. My heart hurts with this news. Such small beings should not have to endure this. I pray for Kai and all family and friends who are battling this. Many blessings to all of and especially to Kai on his journey. What a blessing his life has been. What a blessed child he is to have such amazing people for parents. This is one of the saddest things I could imagine going through. My deepest and most sincere blessings of love and peace to you all. Praying, praying, praying and praying some more. May you find strength today. I am sending you love, light and strength at this time. All of us at Why Me are praying for Kai and your family throughout this journey. Hi, I’ve never met you but was touched by your story that a friend shared with me. Keeping you & your family in my thoughts. I have been following your sweet Kai’s journey. I was Alex’s preschool teacher and his Mom Alana has been sharing about you and how amazing you are. I hate this disease and what it steals from so many babies. As I have watched Alex navigate his blindness and fight his brain cancer, I am even more amazed at Moms like you and Alana and your strength and courage to fight , care for and love your sons. I can’t even imagine what your heart goes through every minute. Your sharing your journey has def. increased the worlds awareness of this awful disease and hopefully more babies will be spared of this because of your ability to let so many look in the window of your life. Prayers for a peaceful journey for you all. I’m a stranger, but I wanted you to know there are many who are praying for you and your little one. God bless you in this extraordinarily difficult time. I was introduced to your blog by a friend of mine who shared one of your recent posts…today I read your ENTIRE blog up until present and I was in tears all day…I also smiled for the good posts and most amazing pictures of Kai. WOW he is a beautifiul boy! I follow many families I have read many blogs of these amazing children fighting different types of cancer, Every storyis engrained in my heart. As a mother of 3 young children And after becoming aware of childhood cancer I have learned many things from your journey and the journey of those that I have fortunately come across but one very important thing and it is more of a reminder…and that is to hold every moment with your child or children close to your heart and treasure them indulge in them because tomorrow is not promised. I thank you so much. I have been raising awareness for pediatric cancer for about one year…yes only one year…last end of Nov/Dec my eyes were wide opened and I haven’t looked back since. I have three children the oldest 8 and last year was the first time I was really exposed to the reality of childhood cancer. how crazy is that! Since then My facebookand twitter accounts are flooded with rallying for pediatric cancer…I try to spread the word daily…and I try to offer comforting words and prayer for those families fighting with their child and those that are still grieving. I volunteer at the Ronald McDonald houses and Make A Wish and donate or support any other organizations that rally for pediatric cancer. I also do these things for children like Kai, all the children battling, those that have unfortunately lost the battle and we still honor, I do it for my kids the kids next door or miles away hoping that it’s making a difference. I honor you your strength your honesty and the pure and solid love you have for Kai. Thank you for letting us into your world and for being his voice. I will continue to be yours as I continue to raise awareness for pediatric cancer 365/24/7 until there is more funding for research, better less toxic treatments for children and ultimately a cure. My heart goes out to you and your family. Kai is such a beautiful and precious little boy. He is so undeserving of this tragic tumor. As i lie here reading your entire blog, i am holding my own 3 month old little boy and i just cannot imagine what you are going through. Stay strong and know that we in Grafton are holding you and Kai in our prayers. I am so sorry for ur loss. Kai walks with Jesus now. He must have been a VERY specail little boy for God to have great plans for him in Heaven so soon. The sadness and pain r here for those of us God is not ready for yet. My heart and prayers are with u. Keep smiling, keep smiling, knowing you can always count on me, for sure, that’s what friends are for. Thoughts and prayers sent during this challenging time from a Camp Sunshine volunteer. I read your entire blog in just a few short days and I have to tell you that it touched me so deeply. I’m so sorry for your loss. I can’t help but love Kai like I love my own. I stumbled upon your blog and Kai’s story by accident and was unable to stop reading once I started. I read your posts in entirety and looked at each sweet picture and then I wept for you and your beautiful boy. I now join all the others who have been touched by Kai’s life and awed by your strength. I have never posted a comment on a blog before but I wanted to let you know that I am so sorry for your loss. I am also inspired by you and how Kai lives on in this blog and through the legacy of his Village. What a beautiful gift from his Momma. I hope that you will continue to write as this complete stranger from Canada is now worrying about you and praying for you. Thank you for sharing Kai. I will not forget him. Kerri, I am truly inspired by you. You blog was a life changing experince for me. You and Kai have made me a better person and I wanted to THANK YOU! There are many things that I am also going through. I also am going through a divorce and the loss of my son changed my life. It was a long time ago. I understand about the sadness and seasonal change. I would love to share my music or audio book stories about grief with you. If you are interested, I’ll mail them (free). Just send me an address to send them. You can email me at: judy@judyunger.com.